Star Wars has a noted history for creating toys out of even the most minor character, or the smallest costume change. Guy with an ice cream maker on Bespin? Action figure. Blue George Lucas? Action figure. 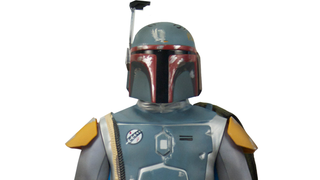 But this Boba Fett toy being made for Comic-Con is perhaps the most bizarrely specific Star Wars toy of them all. Another Jakks Pacific exclusive for SDCC next month, in the vein of their (also wonderfully specific) hologram Darth Vader toy, this 20” tall Boba figure might not seem all that strange to you. Hell, it just looks like Boba Fett, right? 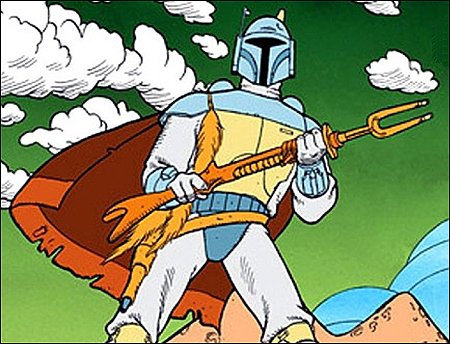 Well, you’d be correct—but what makes this figure so specific is that it’s strictly based on Boba Fett’s first ever appearance. While many fans remember him from The Empire Strikes Back as well as his animated debut in The Star Wars Holiday Special, his true first appearance was as a member of the Star Wars delegation in the San Anselmo County Fair on September 24, 1978! At the time, Lucasfilm was headquartered at 52 Park Way in San Anselmo, about twenty minutes north of San Francisco. As part of harvest parade, Darth Vader and for the first time in public, Boba Fett, marched throughout the street waving to fans of all ages. The armor was worn by assistant film editor Duwayne Dunham and featured several noticeable difference such as the brightly colored blue jump suit, yellow and red armor highlights, as well as the “tribal marks” on his helmet; all altered for his later film appearances. Which, wow. This goes beyond any sort of nerdy granularity Star Wars toys usually go for. It’s literally an action figure of a Lucasfilm editor’s cosplay. But get this: This isn’t even the first time this version of Boba has been made into a toy. Medicom put out both a Vinyl toy and a Kubrick minifigure based on the “County Fair Boba” design as part of their Star Wars lines, going to show that the market for anything Star Wars is frankly kind of insane. And wonderful, sure, but mainly insane. Jakk’s new “1st Appearance Boba” will be available exclusively at San Diego Comic-Con for $50.